Across the globe, Hair Fashion Night is the biggest night ever dedicated to hair trends and beauty. 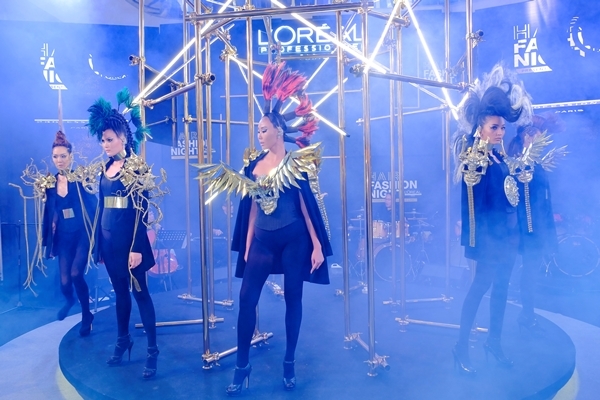 L'Oreal Professionnel brings the First Ever Hair Fashion Night in Malaysia, a worldwide initiative gathering together women and hairdressers to Pavilion Kuala Lumpur Centre Court. In addition, this is the perfect platform for women to have 1st hand access to our L'Oreal Professionnel's hairdressers and their expertise. Hair Fashion Night is a fantastic opportunity to liven up the huge network of L’Oréal Professionnel salons worldwide to modernize the image of hairdressing, showcase hairdressers’ expertise, talent and passion, boost business network and attract new clients to salons too. What makes this night extra special is that L'Oreal Professionnel Malaysia has taken this to greater heights by combining Colour For Life, a local fund raising initiative for children living with HIV, making this the biggest star-studded hair fashion charity event in Asia Pacific. Colour for Life initiated by L'Oreal Professionnel in 2002 is a nationwide fundraising campaign for The Malaysian AIDS Foundation to give hope and help children living with HIV. To make this campaign bigger and bolder, L’Oreal Professionnel collaborated with 8 renowned designers -all maestros in their respective fields. Besides the existing 5 renowned designers in our previous campaign namely Datuk Professor Dr Jimmy Choo Yeang Keat (OBE), Dato Tom Abang Saufi, Eric Choong, Winnie Sin and Royal Selangor, we are extremely proud to have 3 new designers such as Melinda Looi, Sereni & Shentel and Samantha Lee on board. These designers have contributed their master pieces which are imprinted on t-shirts and are wore by a host of celebrated personalities with the likes of Datin Paduka Marina Mahathir, Erra Fazira, Ziana Zain, Tasha Shilla, JC Chee, Debbie Goh and many more. To raise funds for the children, these exquisite designs have been printed and recycle bags and are available for sale for RM30.00. The grand star studded launch began with songstress Poova singing the Fight Song as 15 Malaysian Beauty Queens and Top Supermodels such as Deborah Henry, Amber Chia, Kiran Jassal strut down the Spanish Steps holding the hands of little girls wearing tutu. This is followed by 2 junior musicians wowing the crowd jamming Sweet Child of Mine. In his opening speech, L’Oreal Malaysia’s new Managing Director, Mr Malek Bekdache shared “ We are extremely proud that Malaysia is the only country in Asia Pacific participating in this worldwide initiative and he proclaimed Hair Fashion Night as the place for women to discover and test the latest hair trends and for our hairdressers to showcase their professional expertise, talent and passion”. The highlight of the show is a collection from the runways, artistically crafted and embodied by style, from the highly loved chignon and the mohawks to the women of desire brought to live by 6 L’Oreal Professionnel Artistic Ambassadors – Albert Nico, Andy Chan, Kevin Woo, Max Chang, Miko Au & Simon Koh. The crowd was mesmerised by showcase of the hair master pieces on 16 muses wearing renowned designer Orson Liyu’s magnificient and stunning collection. Joining us in the star-studded celebration was our renowned designers Datuk Professor Jimmy Choo Yeang Keat, Dato Tom Abang Saufi, Eric Choong, celebrity guests such as Datin Paduka Marina Mahathir, Dato Bernard Chandran, JC Chee, Fahrin Ahmad, Fyza Kadir, Lynn Lim, Carey Ng, Jack Lim and many more. The charity hair cut drive on the 17th May 2016 wad official visited by Yang Bhg Dato Sri Rohani Abdul Karim, Minister of Women, Family and Community Development and celebrity guest such as Erra Fazira and Datin Paduka Umie Aida. The charity hair cut which was open to the public from 10am-8pm received an overwhelming response. Our salon partners who have kindly contributed their time and effort to raise funds for the children managed to cut a total of 550 people. First time heard about hair fashion show. Hahaha. Love it!